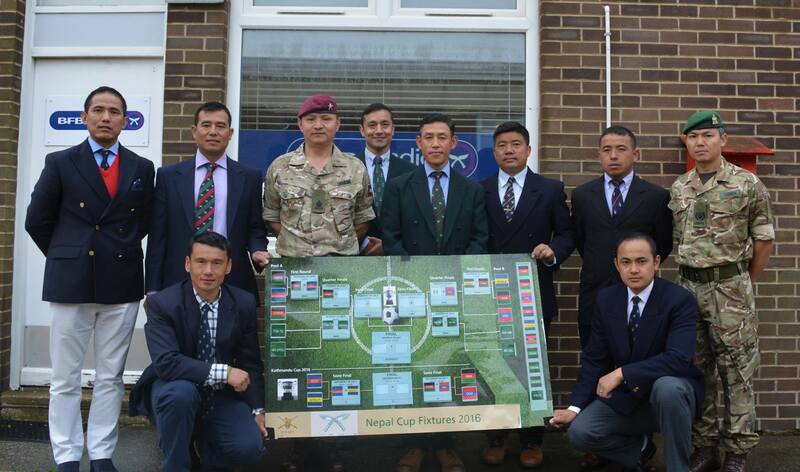 On Tuesday 31 May 2016, representatives from all those Brigade of Gurkha (BG) units competing in the Nepal Cup 2016, attended a draw at the BFBS Shorncliffe Studios. 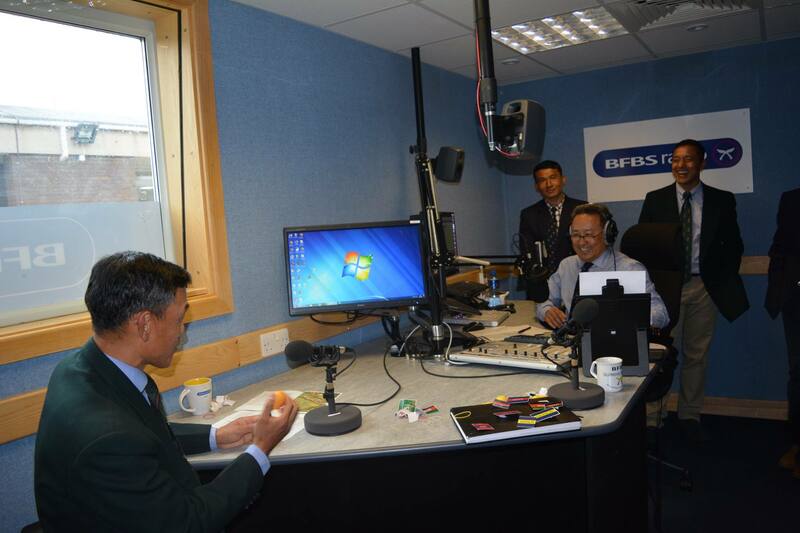 The draw was aired live on BFBS so that listeners could listen to the exciting results globally. 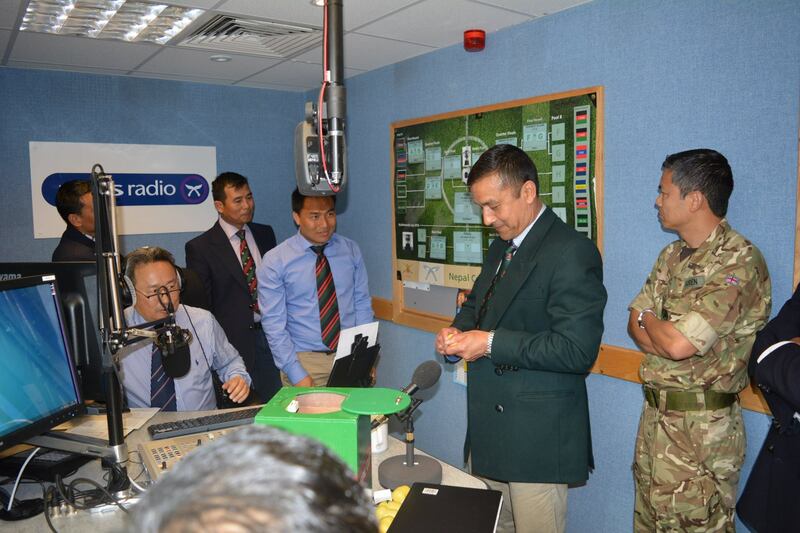 The draw was hosted by Capt Muktiprasad Gurung, SO3 Plans/QGOO from Headquarters Brigade of Gurkhas. This is an annual football competition between serving units of the Brigade and it is always very competitive and great fun to watch. Each representative drew a ball from the pot with no idea which unit it represented. The results are shown below, with 2RGR, The Queen’s Gurkha Engineers (QGE), Gurkha Company Catterick (GC ITC), Close Support Troop (ARRC) (CSp Tp), Gurkha Wing Mandalay (GW(M)) and Gurkha Wing Sittang (GW(S)) all being fortunate to be drawn straight into the Quarter-Finals. 1RGR will have to play the Queen’s Own Gurkha Logistic Regiment (QOGLR), and Gurkha Staff and Personnel Support Company (GSPS) play the Queen’s Gurkha Signals (QGS) on 30 June 2016 at the Royal Military Academy Sandhurst to fight for a place in the Quarter-Finals. All the finals will take place during the first 2 weeks of July with the actual final being held during the Brigade of Gurkhas Bhela at Queen’s Avenue Aldershot on 09 July 2016 at 1400hrs. 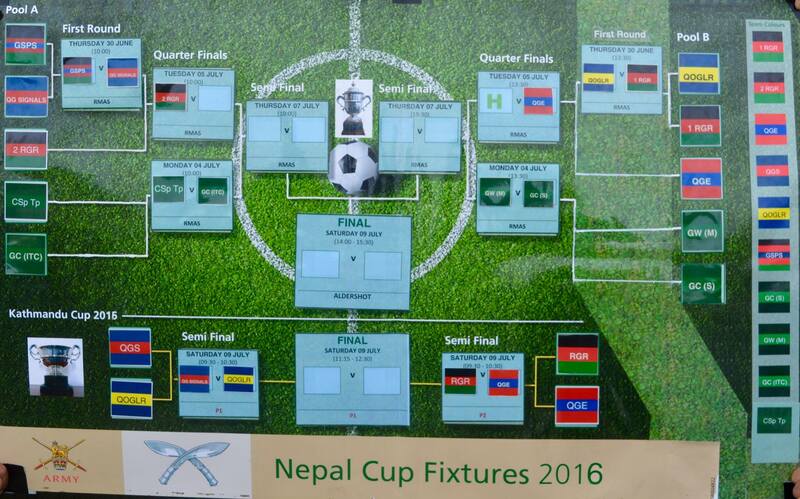 At the same time, the games from the Kathmandu Cup will also be played. This is a competition for retired servicemen from some of the BG units. Entry is free to come and watch and there will be lots of other events happening in the background during the Bhela including a fun fair, food stalls, performances from The Band of the Brigade of Gurkhas, Parachute Display Teams, and Archery lanes. Best of luck to all teams involved and may the best unit win!